Watch high-quality peer-reviewed videos of cutting-edge surgical and diagnostic imaging techniques and technologies covering thyroid, parathyroid, pancreatic, pituitary, and adrenal tumors and diseases, with minimally invasive, robotic, and open surgical procedures. This rapid publication videojournal offers a dynamic new venue for physicians and surgeons to share their techniques and showcase new approaches. VideoEndocrinology™ is included with your subscription to the monthly flagship Thyroid . VideoEndocrinology™ delivers high-quality peer-reviewed videos of cutting-edge surgical and diagnostic imaging techniques and technologies covering thyroid, parathyroid, pancreatic, pituitary, and adrenal tumors and diseases, with minimally invasive, robotic, and open surgical procedures. This rapid publication videojournal offers a dynamic new venue for physicians and surgeons to share their techniques and showcase new approaches. Videos can be easily searched, viewed online, and downloaded for use on a tablet or other mobile device allowing on-the-spot access where and when it is desired. Videos can be downloaded and shared with colleagues, facilitating optimal patient care. VideoEndocrinology is included with your subscription to the monthly flagship Thyroid. Thyroid is under the editorial leadership of Editor-in-Chief Peter A. Kopp, Division of Endocrinology, Metabolism, and Molecular Medicine, Northwestern University; Clinical Thyroidology Editor-in-Chief Angela M. Leung, UCLA; VideoEndocrinology Editor-in-Chief William B. Inabnet III, Icahn School of Medicine at Mount Sinai; and other leading investigators. Editor-in-Chief Gerard M. Doherty, MD, Boston University School of Medicine, discusses the types of videos that will be published in the new peer-reviewed videojournal VideoEndocrinology. Videourology™, the online peer-reviewed complement to Journal of Endourology, offers high-caliber video demonstrations of the latest cutting-edge robotic and laparoscopic surgical techniques and technologies as well as urologic endoscopic treatments designed to enable physicians to view and evaluate new minimally invasive and noninvasive techniques and apply them to their practice. Videos can be easily searched, viewed online, and downloaded in Flash, QuickTime®, and MP4 formats for use on a tablet or other mobile device allowing on-the-spot access where and when it is desired. Videos can be downloaded and shared with colleagues, facilitating optimal patient care. Part B, Videourology is included in your subscription to Journal of Endourology. 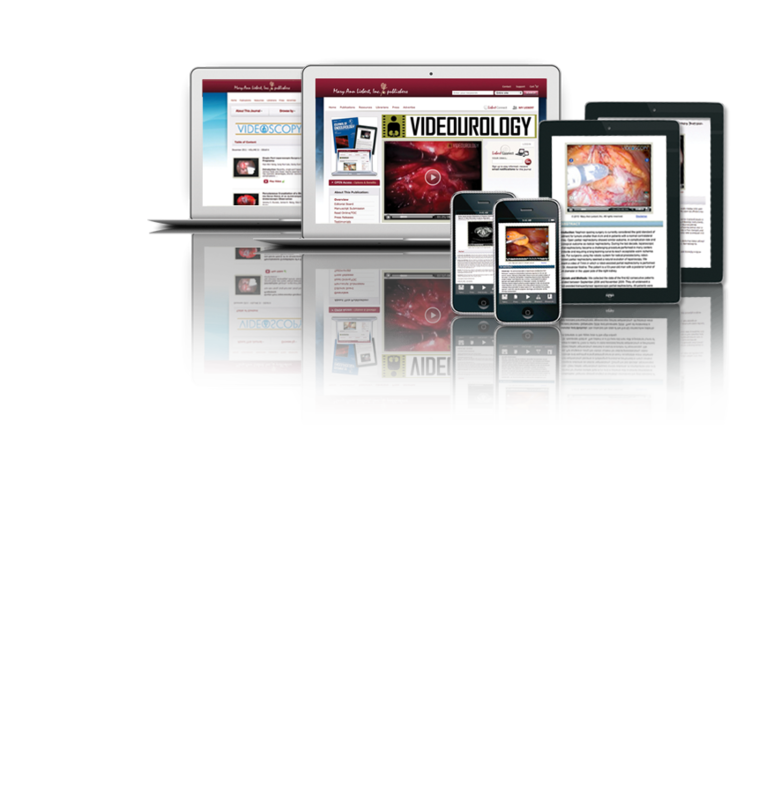 Selected videos in Videourology is included in your subscription to Journal of Endourology. Selected videos in Videourology are included in the AUA Core Curriculum. Videoscopy™, the online complement to Journal of Laparoendoscopic & Advanced Surgical Techniques (JLAST), offers high-caliber video demonstrations of peer-reviewed, cutting-edge surgical techniques and technologies designed to enable physicians to view and evaluate new surgical and microinvasive techniques and apply them to everyday surgical practice. Videos can be viewed or downloaded in Flash, QuickTime®, and MP4 formats for use on your tablet or other mobile device allowing you on-the-spot access where and when you need it. Videos can be searched, downloaded, and shared with colleagues, facilitating optimal patient care. Part B, Videoscopy is included in your subscription to Journal of Laparoendoscopic & Advanced Surgical Techniques.